Education is big business these days, with leaders of schools and academies more like the CEOs of successful companies and a growing range of businesses supporting learning needs. We’re proud to put our specialist subject of Exhibitionology to work for a range of clients supporting teachers, pupils and educators at all levels. BETT 2018 is a huge annual exhibition of education and technology. 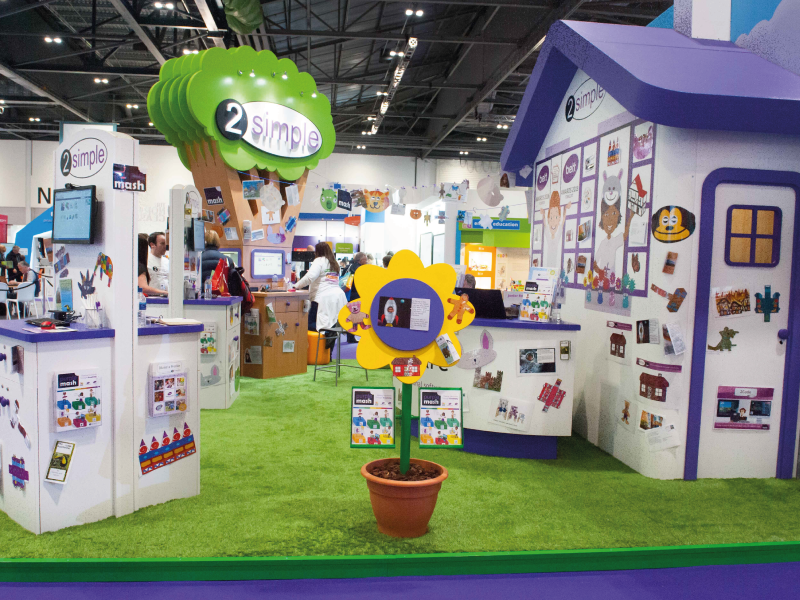 Here’s how we helped our clients attract attention and interest in their brands at this massive showcase event. 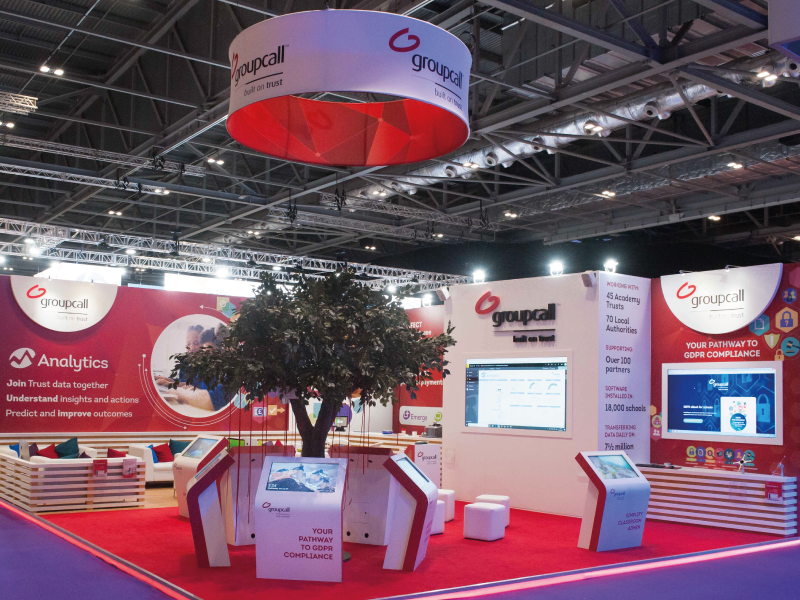 A realistic tree of knowledge was the huge point of interest on Groupcall’s stand, acting as a centre point for meetings, demos and hospitality for their data and identity management business. As always, it’s the things behind the scenes that mean events run smoothly as well as making a big impression. 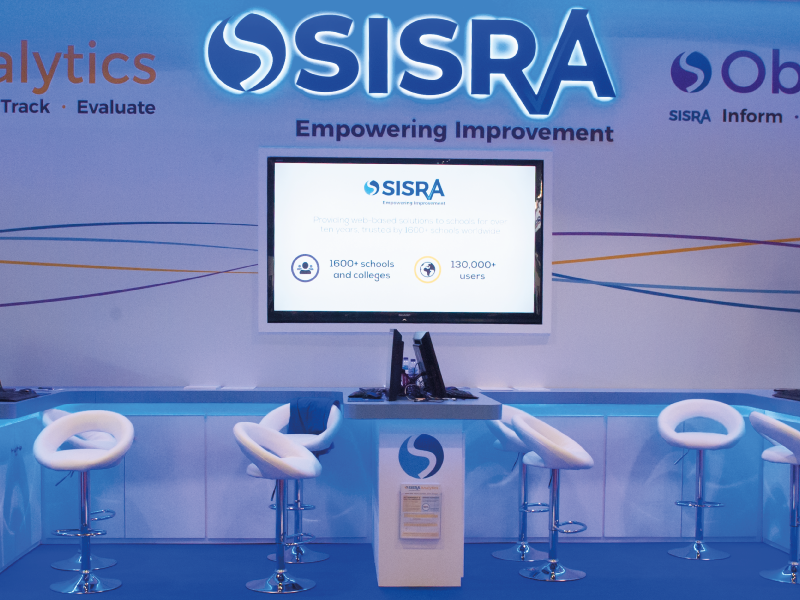 With Imagine Events making sure that 2 miles worth of wiring connected up all the screens and demo points, this space not only looked great, but performed well for Groupcall too – attracting a great deal of interest and leads throughout the show. 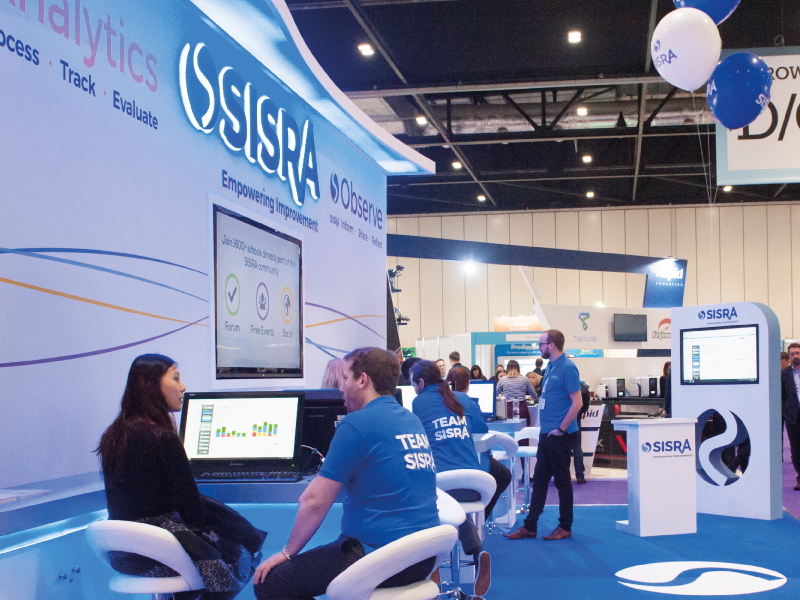 Making sure the technology works is a big part of what we do at Imagine Events, so the large screens, computers, touch screen podiums and sophisticated PA system we put into place for SISRA are all part of the job. Adding attention grabbing blue halo lighting to their logo, was our way of making sure this student performance tracking and results analysis brand made an impact in the busy space. 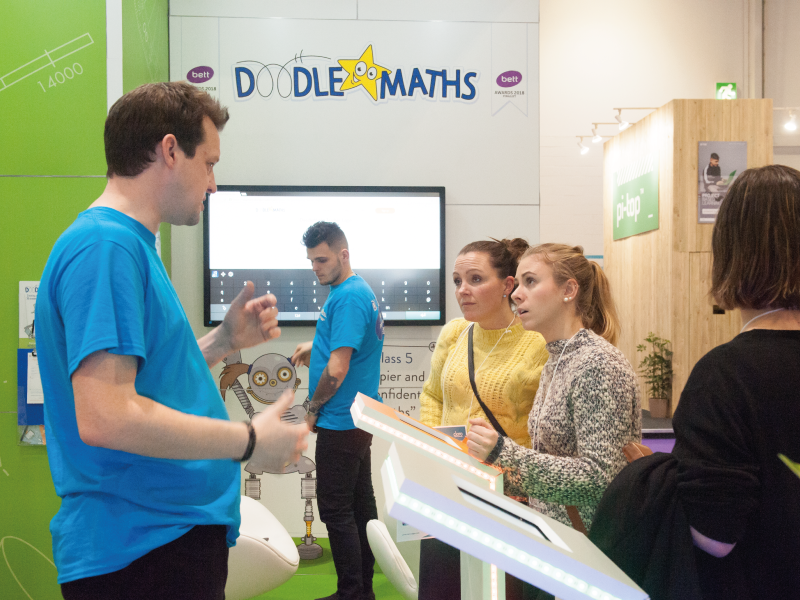 When your business is about making maths homework fun, bringing that energy, enthusiasm and passion to life in an exhibition space is vital. That’s what we helped EZ Education, inventors of DoodleMaths, to do. 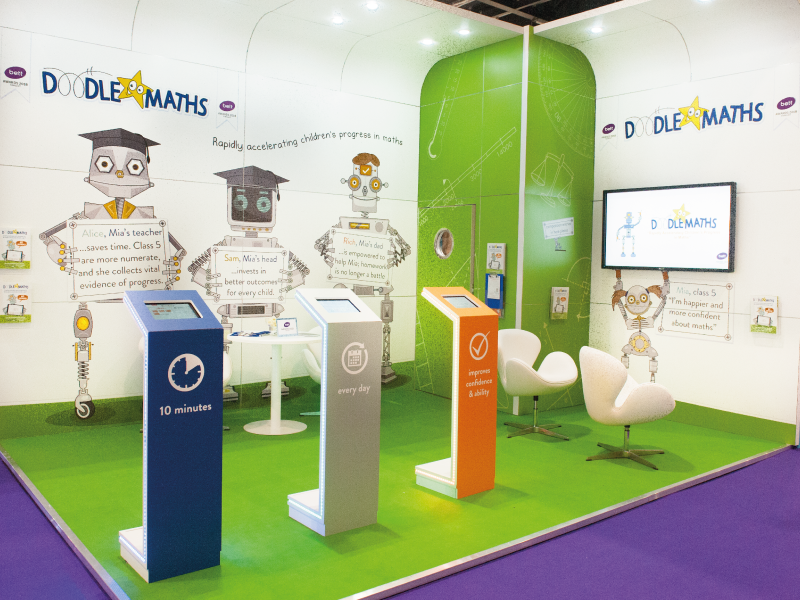 Using their bold, bright brand colours and robot characters we drew visitors’ eyes to their stand, then enticed them to get hands on with the technology using LED edged iPad stands. It proved a big hit and a sure way of engaging prospective customers. Easy access demo points, a presentation area, coffee bar and seating area provided Schools Broadband with a flexible space they could use to talk to visitors and showcase what they have to offer to educators. With unmissable branding they scored high on the attention scale. 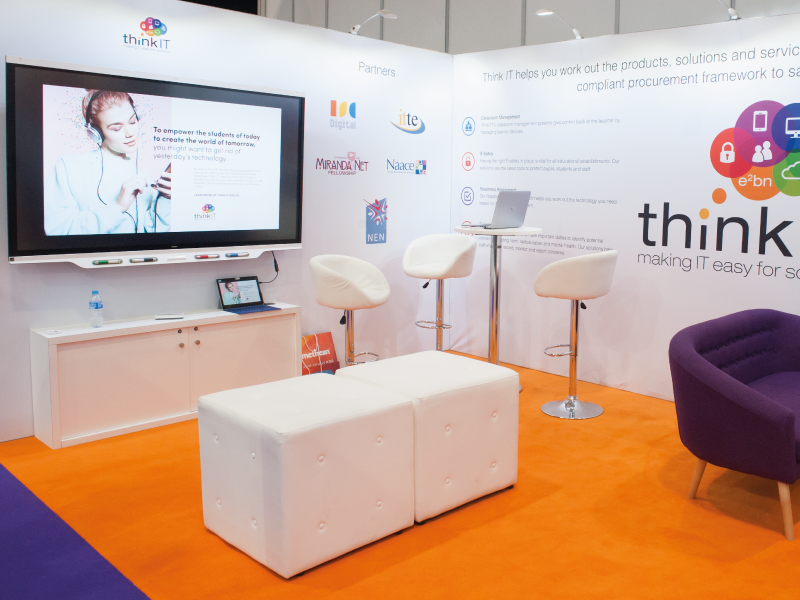 You don’t always need a large space to create a buzz around your event experience as we proved with Think IT. 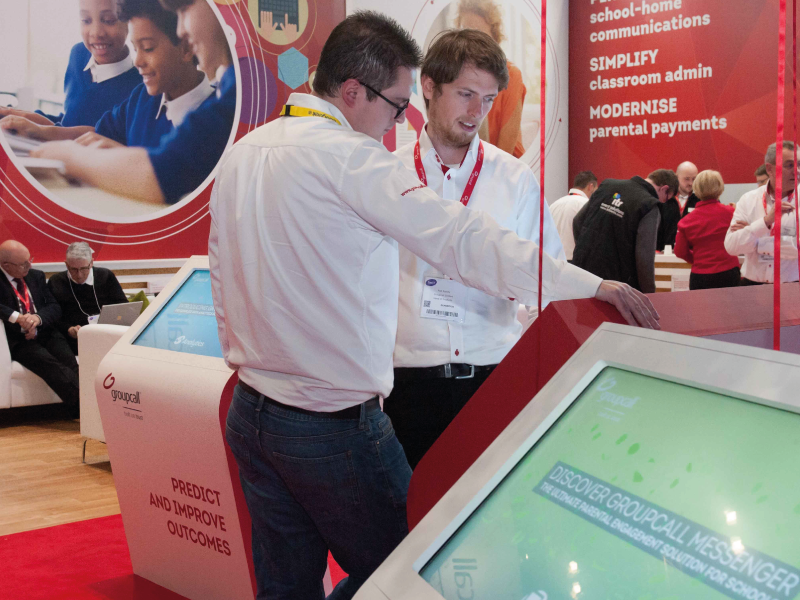 Mounting a 75kg touch screen TV to one of the walls helped create an accessible demonstration space where they engaged with visitors to generate high quality leads throughout the day. 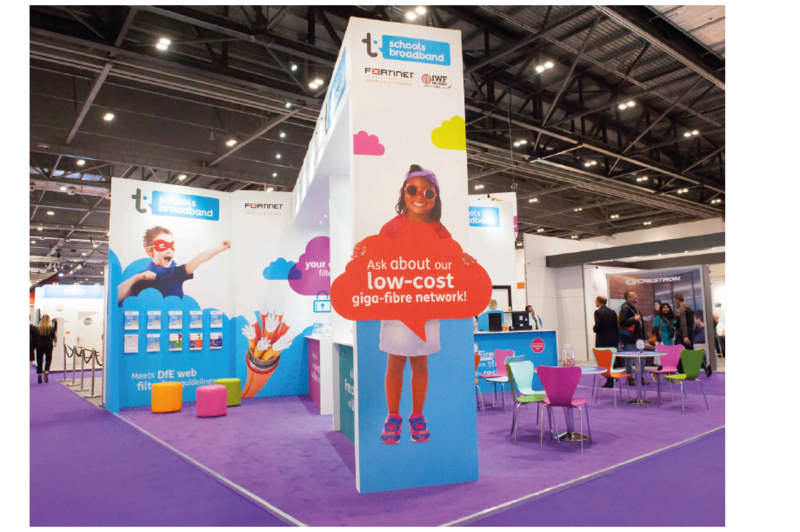 Clear brand images and messages on large format textiles gave them visual stand out in a busy exhibition hall. 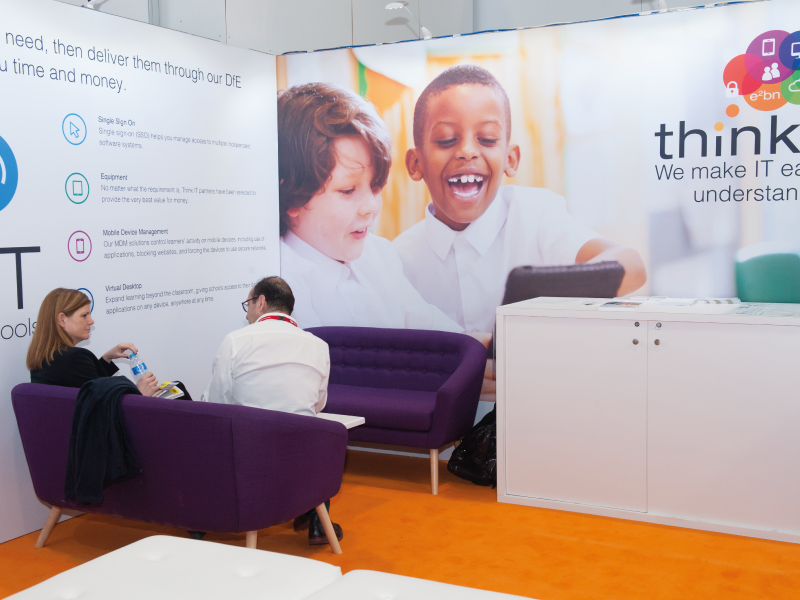 We have been working with 2Simple at BETT since 2013, so it’s like meeting old friends when we put their stand together. 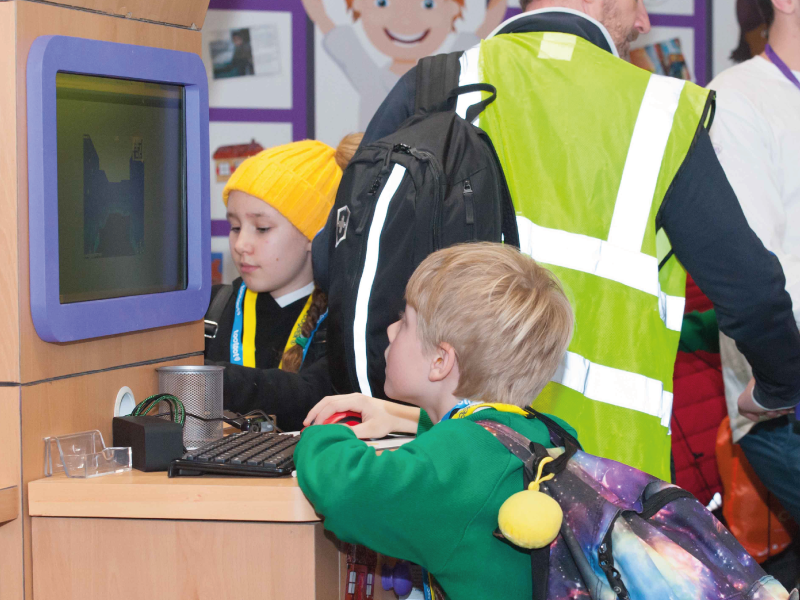 Their educational software for schools is fun and feature rich, which we reflect in the bright colours and child friendly demo stations. 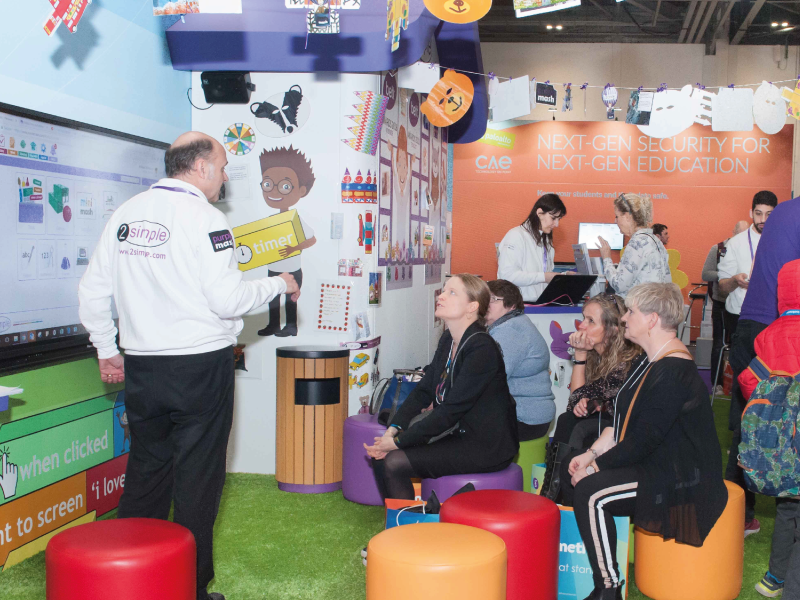 For BETT 2018, we changed the layout to allow greater access to visitors and thanks to our careful planning, maintenance and a little refurbishment we were still able to incorporate many of the original stand-out features such as the house and the tree that make this space appealing to visitors, old and young. 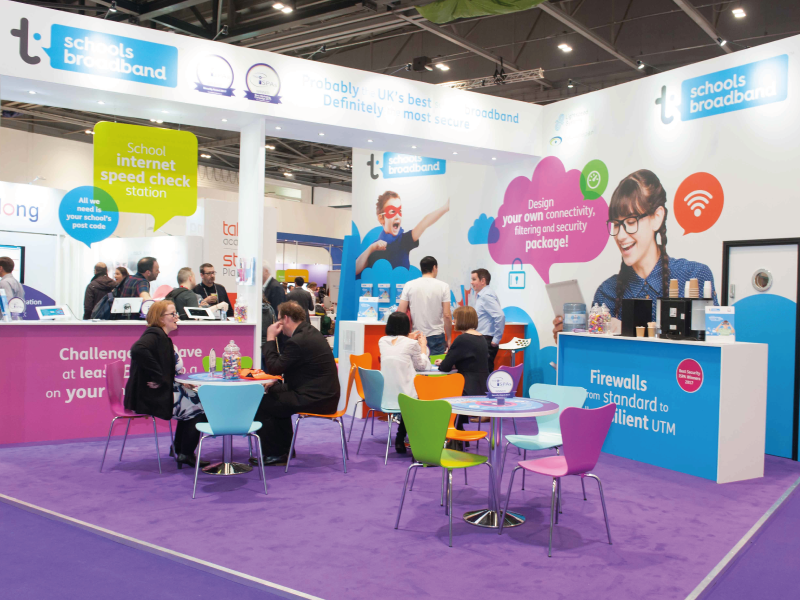 Are you looking to create amazing experiences, events and exhibitions that entice customers to connect with your brand? At Imagine Events, we apply a unique blend of knowledge, skills and design to create a stage for your sales and bring your brand to life in a way your customers can’t ignore. We call it Exhibitionology. We design, create, install and dismantle. We deal with all the logistics of your event, so all you have to do is turn up. Talk to us about your events today.